Come Look Inside to see the Amazing History! From the Civil War to Operation Enduring Freedom, the Museum has pieces from almost every war the America has been a part of. The display cases have small firearms, telescopes, swords, medals, uniform items and other things that servicemen used through the many years. You can wear the bulletproof jacket that today's soldiers wear, if you ask of course. You can also feel the weight of the backpacks they have to carry all day and night.Those packs weren't light. During Museum hours, you can have a group tour. Your guide will answer any questions and tell you about each part of the Museum. Come see the cool history of American Wars. Each one of the guides and helpers that run the museum are all volunteers. The museum is run by donations and volunteers alone. And they need your help. So please come visit the Park and Museum when you can. 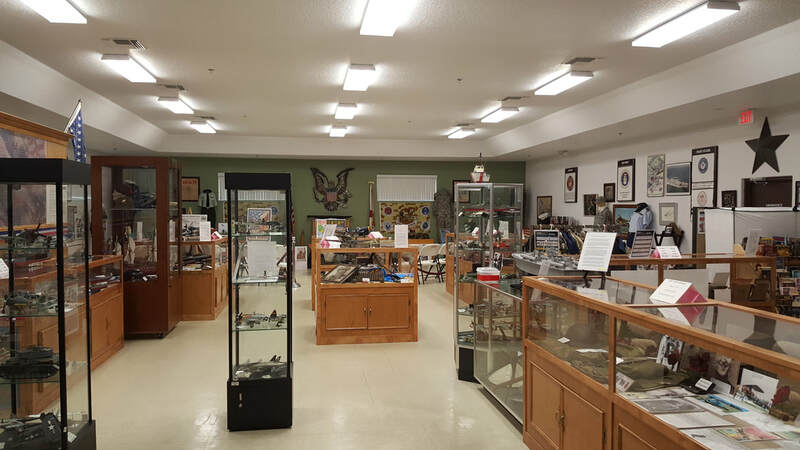 Take a look inside our Museum! Look at the Amazing Pictures and Stories Inside! ﻿Inside the Museum you can find plenty of stories about each exhibit. From the story of that suit in a war to how the exhibit came to the Museum. There are enough stories to fill anyone's imagination!